Timely warning of natural and environmental disasters and accurate climate prediction, in addition to understanding, conservation and efficient management of scarce resources such as biomass, biosphere, mineral resources, water and energy are essential requirements for sustainable economic development. Information about climate, climate change, weather, cryosphere, precipitation, pollution and disasters is a critically important everyday issue for the global community. Radio systems are fundamental to monitoring the climate and to helping countries mitigate and adapt to the effects of climate change, and to address its major challenges. 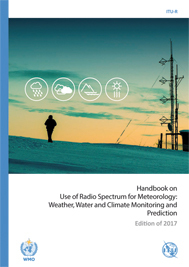 This Handbook provides an overview of the use of radiocommunication systems to monitor the various manifestations of climate change and their impact, as well as the application of ICTs and radiocommunication as a means to reduce global energy consumption. Please note the availability of the English pdf and English hard-copy edition. Other language editions now available in pdf (free) or hard-copy upon request only (paying). Any pre-order will be charged in full. Thank you for your understanding.